REPORT Lower Manhattan retail is undergoing a retail renaissance, with three major new proj- ects eager to tap the market's burgeon- ing consumer base. The first to open, Brookfield Property Partners' Brookfield Place, is a reimagining of the former World Financial Center building's 375,000 square feet of retail space into an upscale luxury mall. Since the center opened in March, tenants have been reporting above-average sales, said David Huesser, CSM, general man- ager of the shopping center, at a June SCTLive event in New York City. "These stores are aggressively marketing them- selves to tourists and office workers," he said. "They're not just opening the doors and waiting for customers to come in." Saks Fifth Avenue will open a store at Brookfield next year. On the banks of the East River, Howard Hughes Corp.'s eight-block Southstreet Seaport District revitalization is well under way, with retail leasing efforts focusing on local tenants, says Brent Habeck, vice president of strategic leasing for Howard Hughes. The district's Seaport Studios highlights local fashion brands. "We're very New York–centric," he said. "No national or even regional brands." Meanwhile, the World Trade Center district will serve as the spine of downtown, with a broad range of tenants serving a variety of tastes, says Peter Huddle, Westfield Group's senior vice president of U.S. development. "We're serving everyone from residents to tourists to office workers," he said. The center is on track to open next year. "We're about two-thirds of the way toward finishing," said Janno Lieber, president of World Trade Center Properties and Silverstein Properties. "It's a better version of New York City." One of the challenges of developing downtown, especially in the World Trade Center zone, is dealing with a network of public institutions such as The Port Au- thority of New York and New Jersey, not to mention vocal citizens groups, executives said. But work- ing with the city also has its benefits, as landlords can pass along utilities savings and other cheaper services to tenants through the city's economies of scale, Huesser said. New retailers are driving up rents in Lower Manhattan, but prices remain well below some of New York City's bet- ter-established shopping districts. Average asking rent for ground-floor retail space in the financial district is $234 per square foot, up by 4 percent from a year ago, according to the Real Estate Board of New York. Downtown stalwart Century 21 is benefiting from the retail growth, says Eddie Gindi, the department store chain's co-owner and executive vice president. "Twenty years ago Century 21 wasn't open on Sunday," he said. "Downtown was not a destination. Now downtown is not just a financial center, it's a vibrant community that's full of all the top industries." Will all this new space prove too much for the market to handle? "We haven't added a lot of GLA," Habeck said. "We've reinvented what already existed." 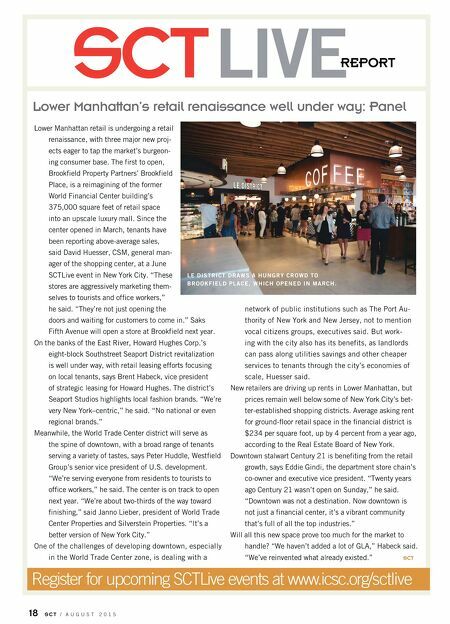 SCT Register for upcoming SCTLive events at www.icsc.org/sctlive 18 S C T / A U G U S T 2 0 1 5 Lower Manhattan's retail renaissance well under way: Panel L e d i s t r i c t d r a w s a h u n g r y c r o w d t o L d p L a c e , w h i c h o p e n e d i n m a r c h .